Curiosity Piqued. 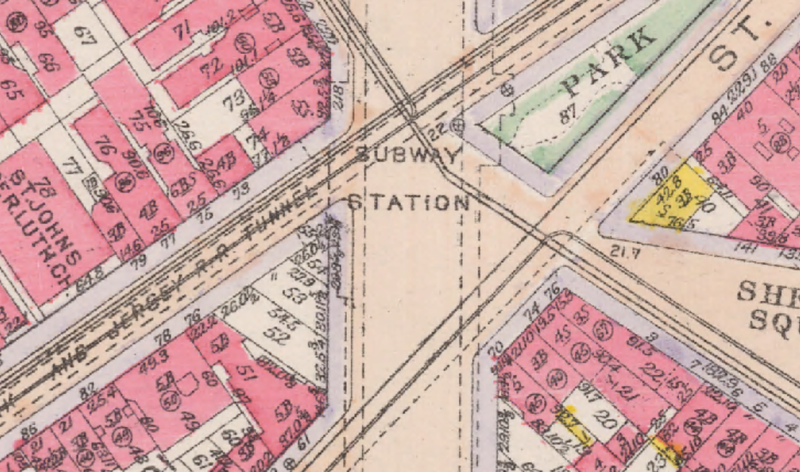 The article goes on to recount the story of how this triangle came to be: In the early 1900s, New York City extended 7th Avenue (and the IRT subway line beneath it) and drew a 100-foot wide path through 11 blocks of Greenwich Village. If your property was between these lines, it was set to be demolished. 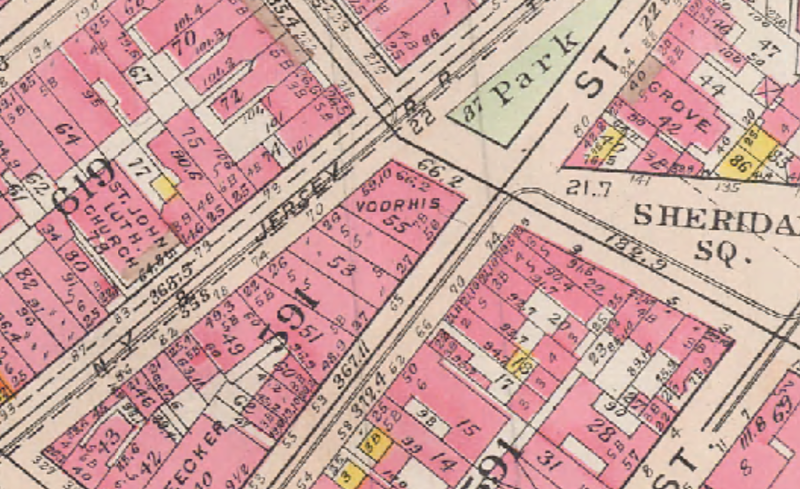 Our little outspoken triangle was the teeny, tiny corner of a property that once held an apartment building overlooking Sheridan Square, where Christopher and Grove Streets now intersect with 7th Avenue. The owner of this apartment building was named David Hess. He died a few years after the taking, but in 1922, his estate saw fit to leave a little message for the world to know what injustice had occurred in the name of progress. 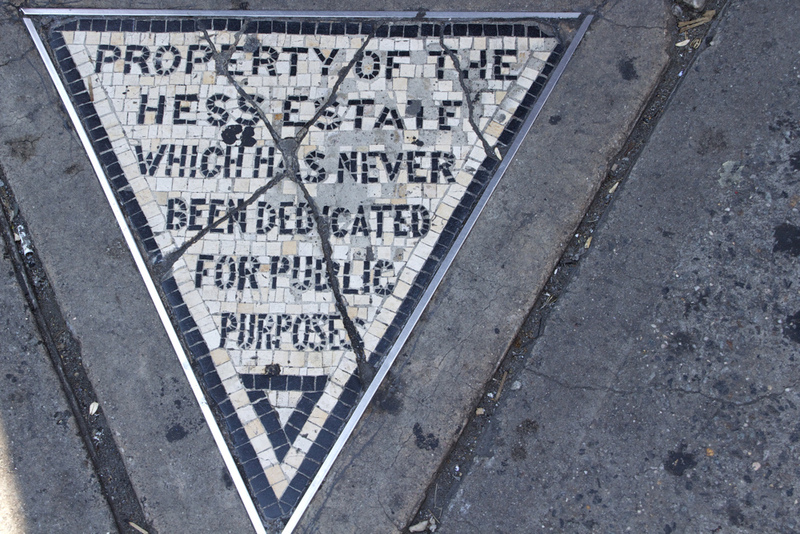 Hess’ Triangle can be found on the sidewalk in front of the entrance to Village Cigars at the corner of Christopher Street and 7th Avenue. Naturally, I got to googling, and dug up everything I could about this amazing little triangle. I wanted to know about the building that was there, when it was finally torn down, how hard Hess and his fellow property owners fought to save their buildings, and who made the decision to lay the tile. It turns out there are many other triangles just like it, and you’ll never look at 7th Avenue in the village the same way again. My first intuition was to check out the historic maps available from the New York Public Library to verify the existence of this doomed apartment building. First, here’s a current OSM map to get you situated. 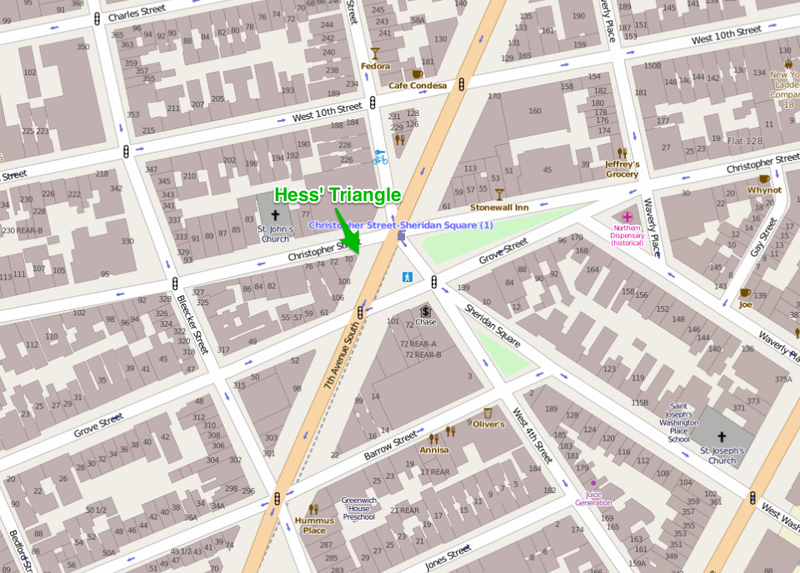 Hess’ Triangle sits at the southwest corner of the intersection of Christopher Street and 7th Avenue, in front of the entrance to the small triangular building that houses Village Cigars. The lot is marked “VORHES”, though some articles call it “Voorhees” or “Voorhis”, the name of the apartment building. What’s even more interesting is the Block and Lot numbers, which remain the same today. The 591 you see in the bottom left corner is the Block Number, and the 55 written inside the plot is the lot number. These days, we refer to lots by their BBL, or Borough (1 digit), Block (5 digits), and Lot (4 digits). So the BBL of the Vorhis Apartments would have been 1005910055! If you follow the current building line of 7th Avenue, you can clearly see that it would nip a tiny little corner off of the Vorhis lot! 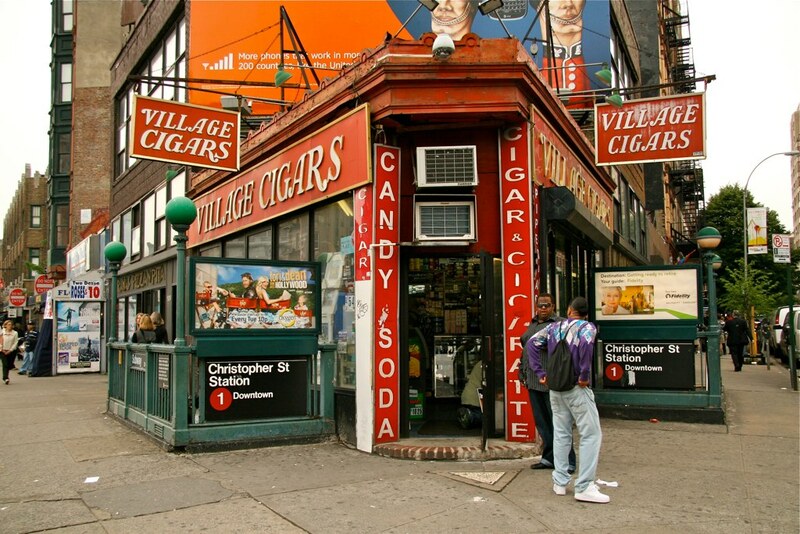 You can also see that the adjoining buildings also got clipped, and the triangle-shaped building that is now Village Cigars was once a mighty quadrangle with faces on Christopher and Grove Streets. 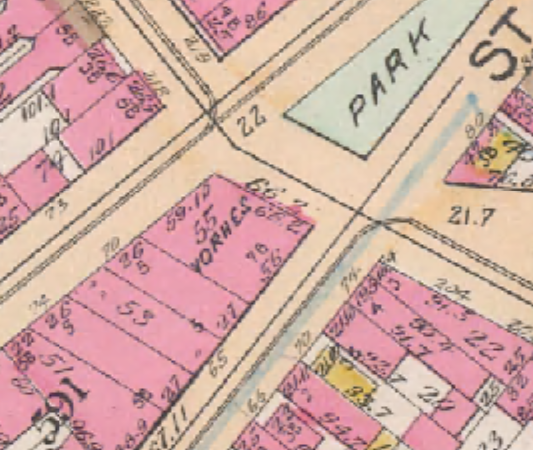 Another Bromley Atlas from 14 years later (1911) shows the building still standing, but the 100 foot-wide path for the 7th Avenue extension seems to be lightly sketched over the condemned buildings. You can clearly see that a tiny corner of the lot, now spelled “Voorhis”, lies outside of the path of destruction. But wait, is that a 55 I see at the corner of Christopher Street and 7th Avenue? Lot 55 lives! We can’t see the line separating it from Lot 54 at this resolution, but it’s there. All three of the Bromley Atlases shown above show that the Christopher Street faces of lots 52, 53, and 54 are each 26 feet. Using QGIS, we can measure each one. The measurements match up for lots 52 and 53, but lot 54’s Christopher Street Edge is 29.57 feet! So one edge of Hess’ Triangle was 3.57 feet long. 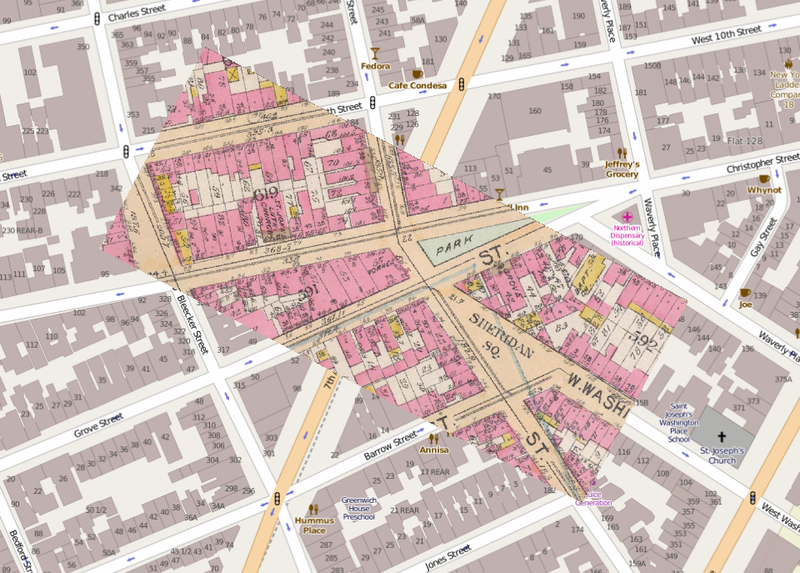 Assuming the edge that ran between Christopher and Grove Streets was parallel to those of its neighbors, we can actually separate the polygon from lot 54 and give Hess’ Triangle its rightful lot number of 55 once again! There it is! 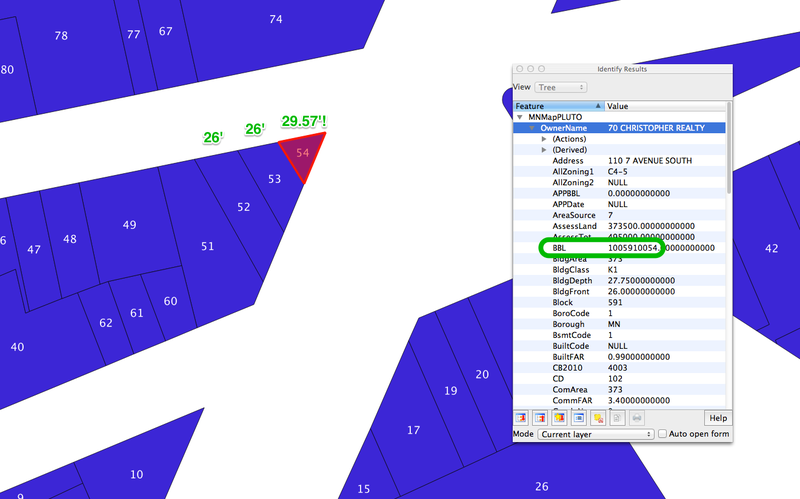 According to QGIS, its area is about 7.3 square feet. For all you geonerds, here’s Hess’ triangle as a shapefile (NY State Plane Long Island feet) and GeoJSON (WGS84). Edit 9/3/14: My friend and fellow map nerd Elliott Plack in Baltimore uploaded the geoJSON to github so you can see it on a map. Lots of original news articles referencing David Hess’ Doomed Building, and one written the day after the tiles were laid in 1927. 8 Responses to "In Search of Hess’ Triangle – Part 1"
Curious, what is the area of the actual triangle with the tiles? Funny enough, I have not had occasion to actually go visit the site. (hooray internet!) 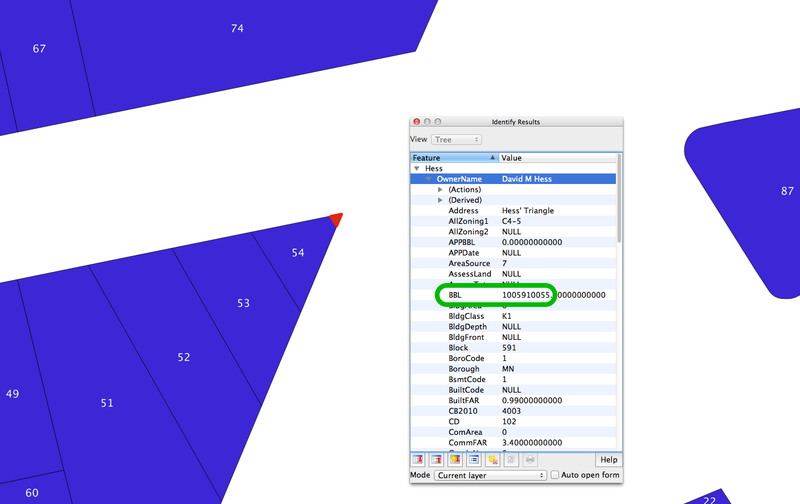 The actual tiled triangle is smaller than the plot of land was. Google it and you’ll see photos of people’s feet for comparison. I am making a short video about the Hess Triangle and would love to use your QGIS map in the video. Great work investigating this further!